Saw this ad posted on an ISS blog and needed to repost it. Reminds me of what I felt like when I worked NA1SS back in 2010. Please watch the 1 minute long video – it’ll make your day. A quick but active set of contests are the NAQP contests where single ops can operate for 10 of 12 hours contest hours. It started at 1pm ET on Saturday and I took a 30 min break so I operated to 11:30pm ET. This contest also has a 100w maximum and single ops can’t use the cluster. I started out on 10m and 15m. 10m had some activity at the start but not much after the contest was a couple of hours old. I was able to work a lot of stations on 15m before moving to 20m. For a while in the contest, I had more Qs logged on 15m then 20m, but later in the day activity there picked up including until after dark here on the east coast. In a North America based contest like the NAQPs, 40m is usually the band that has the most Qs and that was the case here. I worked both S&P and called CQ on 40m with some ok runs of activity, but nothing very long. Same went for 80m later in the evening with me switching off between S&P and calling CQ. I only worked 1 station on all 5 bands and 9 other stations on 4 bands. 249 unique callsigns were logged out of the 435 Qs. 90% of the contacts were in the continental US, 9% in Canada and the remaining few various NA stations – Guantanamo Bay, Alaska, Puerto Rico, Barbados and St Pierre & Miquelon. Right after I made the last contact, the log was submitted online. It’s since been uploaded to LoTW, eQSL, Clublog, QRZ and score posted to 3830. This past weekend was the CQ WPX RTTY contest and I put in a part time effort. It was a very long week at work and I was pretty tired Friday evening. I called it quits at 100 QSOs in the log even though there was plenty of evening operating hours left. It has been extremely cold here in NJ/NY and Friday through Sunday was going to be near record setting temps. Saturday morning I stayed in bed late and did some other things before getting on the radio around 1pm ET / 1800z. I even had to help out the rotor a little to get it moving since it was so cold (near 0F/-17C) and hadn’t been used in a week. Once it started moving it was fine the rest of the contest. Saturday was also Valentine’s Day and went out to a nice dinner with my wife. When I got back home I spent some time on 40m and 80m though there wasn’t a lot of activity on 80m as you can see from my score summary below. I didn’t stay up very late on Friday or Saturday when 80m probably had the most activity vs 40m. There was a bit of DX to Europe on 40m but most were North America based contacts. 15m was doing well with contacts being made to Japan. I even heard a South Korea station but there were too many west coast ops to break through. Ended up with 289 contacts in the log at the end of Saturday. Sunday I spent more time in the contest. It was real cold out on Sunday with the morning temp being -3F/-19C with a wind chill of -20F/-29C. The morning had good conditions on 15m and 10m to EU and elsewhere and I spent most of my day on those bands with brief spurts on 20m. 10m is a pleasure since most contacts are 1 or 2 calls at most no matter where they are. I had contacts made with just 1 call to Guam, New Zealand and even to some JAs. I guess I recovered a bit of energy from the past work week as it wasn’t a big effort to stay longer at the radio. Late in the contest, JAs were coming in very strong on 15m like they were the previous day. Wrapped up the contest with 576 total Qs in the log which was more then I thought it would be based on how I felt Friday & Saturday. Looking at the stats, out of 576 contacts I worked 74 different DXCCs and 445 unique stations. I didn’t work any stations on all 5 bands but 7 stations on 4 bands and 18 stations on 3 bands. I worked a total of 363 different call prefixes. Some of the more uncommon entities worked – Israel, Samoa, Qatar, Guam, Namibia, New Zealand and South Africa. Logs were submitted to the contest robot, 3830, LoTW, eQSL, ClubLog, QRZ and Super Check Partial. 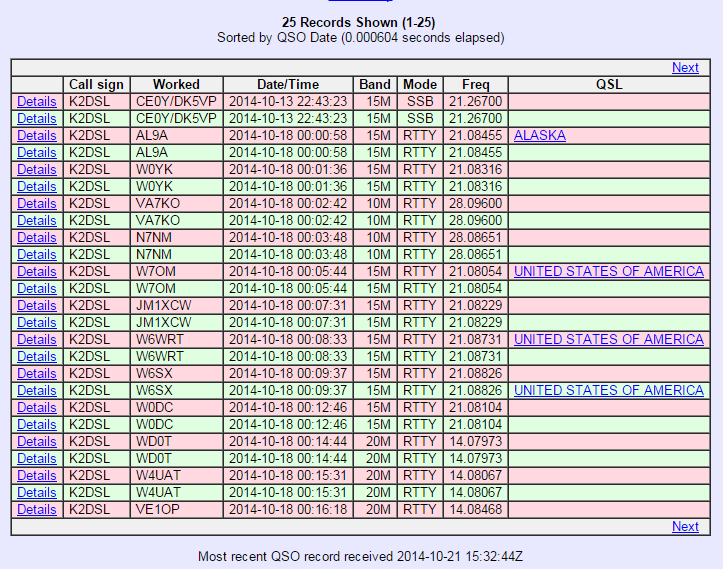 Submitted my DXCC update based on new LoTW QSLs and I end 2014 with 234 DXCC entities confirmed. Made a lot of QSOs for wrapping up the ARRL Centenial QSO Party. As of now, it looks like I finished the year with 24,244 points from 2679 QSOs made with someone that resulted in points. 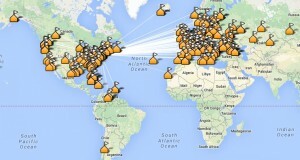 Other then the last 2 weeks of December, all my points and QSOs were from my contest logs being uploaded to LoTW. Those last 2 weeks I went hunting specifically for points for this event. I end up about 15th in NJ based on points. A great start to the year with the Roundup!! 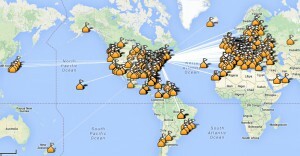 Those almost 1000 contest QSOs moves me past 50,000 total QSOs logged since I got on HF in 2008. Not a detailed summary of those contests, but I needed to get something posted to the site! I’m a bit behind with getting this posted but it was a long week at work. Just before the start of the WAE RTTY contest last weekend I worked RI1ANT in Antarctica so I figured that should be a good sign. On Friday night I ended up with 101 QSOs in the log but hadn’t yet sent/received any QTCs, a twist in this specific contest where you can send or receive 10 other QSOs with an EU station that count as points but not mults. Since the contest started well after sundown here, 10m wasn’t very active and it was already past midnight in Europe, so a lot of activity was within the US. I started out using the current version of N1MM+ which was working fine, but keeping an eye on the N1MM+ Yahoo group I saw reports of issues specifically around receiving QTCs. On Saturday morning I got back on the air and had no issue sending a batch of QTCs but couldn’t get receiving to work, so I decided to export my QSOs and import them into the older N1MM classic. I fudged the one batch of QTCs I sent and modified the cabrillo log at the end to match what N1MM+ had for that QTC batch. The rest of the contest I used N1MM classic. On Saturday, 10m was ok early but seemed to sputter out. I spent most of my time moving up and down each band (10/15/20m) and then switching to another band and doing the same. After taking a break I came back and accidentally launched N1MM+, realizing after I called a station I would send the wrong #. I quickly closed N1MM+ and launch N1MM Classic and apologized to the station. There were 2 or 3 instances when I sent “QTCS?” and a station came back and said “Can’t receive but can send” so I figured they might have been running N1MM+. I ended Sat night with 394 Qs + 480 QTCs. On Sunday, 10m seemed open for most of the contest. I worked RA7A and noticed he was sending 005 to the person before me, me and the person after me. Will be interested to see, if a log is sent in, what it shows. 20m was rather quiet on Sunday with more activity on 10m & 15m. During the afternoon I started calling CQ on 10m and GU0SUP came back to me immediately. You can always count on Phil to hand out Guernsey during a contest. Activity stayed pretty high through the entire contest where I wrapped up with 684 QSOs, 850 QTCs and 521 total multipliers, I think my highest WAE RTTY score to date. According to my SH5 analysis I worked 429 unique stations and 70 different DXCC entities. I only primarily on just 4 bands and I ended up working 15 stations on all 4 bands. Conditions were excellent for the 2014 CQ WW SSB contest this past weekend. Starting Friday night at 8pm, I got on the air and worked some stations but not much. In total for the evening I logged just 35 contacts and it was the only time I was on 40m. I saw 10m stations being spotted in the cluster but I wasn’t hearing any when I listed on the band. It was well after dark and 10m usually won’t be open anyway. I was off the air at 7pm to head out for a Halloween party with my wife and friends. Saturday ended with 396 Qs in the log and 88 different DXCCs which is 1 DXCC worked every 4.5 Qs. On Sunday morning I slept in a little (late night at the Halloween party!) but 10m was still hopping when I got on the air. Though I worked stations on 15m & 20m, I spent most of my time on 10m where again a large portion of the 10m phone band was active with stations. One station in England that was calling CQ asked me how the frequency was and I told him he’s 20+ so it wouldn’t matter what was around him but it was indeed a clear frequency. He replied he’s just running 100w into a dipole. When the band is open, the band is open. I needed to stop operating at 3:30pm ET which is 4.5 hours before the end of the contest. it was hard to turn the radio off knowing there were more stations/entities that could be worked. I ended up logging 617 Qs and added 10 more entities on Sunday for a total of 98 DXCCs logged. Probably if I was aware, I would have gone DXCC hunting for 2 more entities to have logged DXCC in a weekend. 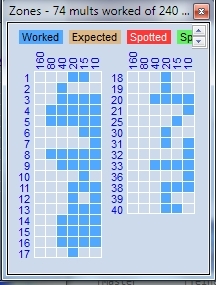 Worked 28 of the 40 CQ zones. The top worked DXCCs logged were Germany, Italy, Spain, Slovenia and France. Though I worked just 8 stations on 40m, 2 of them I worked on all 4 bands I operated. There were 23 stations worked on 3 bands. There were 498 unique callsigns in the log. Terrific weekend on the air! I seem to have this same issue with duplicated QSOs. 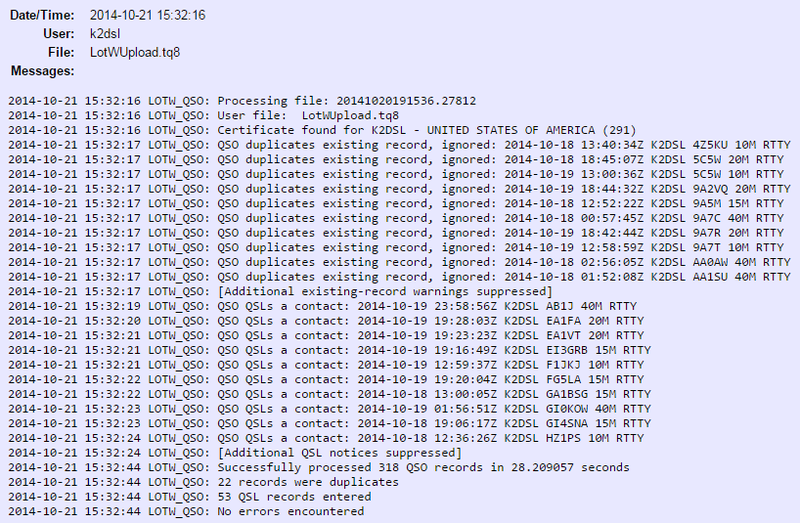 I saw right after my upload was processed on Tuesday that LoTW processed the same log twice, and though my initial review showed that it detected the records as duplicates and ignored them, but that’s not the case. I’ll include screen snippets here for those that might want to check their own data and hopefully the screen snippets come out ok in emails. If not, the message might read better on the web in the Yahoo group pages.This overall issue would seem to be more appropriately resolved by the ARRL vs individuals contacting the ARRL as they should be able to query LoTW and find/remove any true duplicate which is where the uploaded data matches and the only difference is the LoTW generated id (and whatever else they might track and not expose on the front end). But it actually ended up adding duplicates. Go to Your QSO page at https://lotw.arrl.org/lotwuser/qsos?awg_id=DXCC&ac_acct=1 and enter in a Starting Date of a record that was in the batch which LoTW double processed and click the Submit button. As you can see below, records with the same info are duplicated with the only difference being the record ID (which you can see if you click the details link on the left of each QSO). It really makes sense for the ARRL to clean this up behind the scenes as they *should* be able to identify these erroneous duplicates the system created. This past weekend was the JARTS RTTY contest which is fun as the exchange is the age of the person – 00 for YLs, 99 for Multis and the actual age for everyone else. I had very little time to operate so it was a combined total time of about 7 hours on Friday evening, Saturday and Sunday. On Friday night I worked a couple 10m contacts so I was hopeful the band would have activity over the weekend. On 80m I called CQ for a bit and after being spotted it was nice for a couple EU stations to call me. I ended Friday with 82 Qs and 8,044 points. On Saturday I operated a short time in the morning and a short time in the early afternoon and then a very short time late in the evening. I only worked just over 100 contacts on Satuday for an ending count of 187 Qs & 49,140 pts. Sunday was the same thing with a short time in the morning, a brief early afternoon session and 30 mins at the end of the contest. It gave me a total of 317 Qs and 122,400 points which is one of my lowest JARTS totals but given the short amount of time I had to operate I can’t complain. Both during the contest and via email after I had multiple operators thank me for spotting them when I worked them on another band. Even HZ1PS in Saudi Arabia sent me a message during our 2nd band QSO during a pileup he had going. With the contest exchange being age, I threw out the 00’s and 99’s and multiple contacts with the same call and ended up with 230 different calls worked. The youngest age sent was 24 by 2 operators and the oldest age sent was 85 by one operator. The average age of those 230 operators was 58.5 years. The median age (middle value of all stations worked) was 60 and the mode (most common age reported) was 52. Even with the short time available to be on the air, I was able to log 53 DXCC entities including Israel, Turkey, Crete and Saudi Arabia on 10m. Thanks for all the contacts! The Makrothen RTTY contest has a couple of interesting twists. First, the contest has 3 different 8 hour sessions – 1 on Friday, 1 on Saturday and 1 on Sunday. Second, the points are based on distance between the 2 stations with a bonus on 40m and 80m. It really causes your score to skyrocket compared to contests with a few points per QSO. I was exhausted on Friday night and after just 31 QSOs, I was falling asleep at the radio and called it a night. I wouldn’t have stayed up too late anyway as our club had a hamfest in the morning and my alarm was already set for 5am. Saturday I got home from the hamfest about 3 hours after the 2nd session started and got on the radio. Bands weren’t great with no signals on 10m. Even 15m was light with signals so most of the time was spent on 20m. 40m allowed a bit of DX for big points. Ended up at the end of session 2 with 142 Qs and 500k points. Sunday, with 3 hours of the final session gone while I slept, I got a cup of coffee and fired things up around 7am local time. 15m had signals this morning though 10m was still barren. After making some contacts on 20m and with 3 hours left in the contest I checked 10m right at 9am / 1300z and could hear some signals and then some more. 10m was open and stations were flocking to the band. I spent the rest of the contest on 10m and 15m before time ran out and I had 286 QSOs logged with 1.4M points. 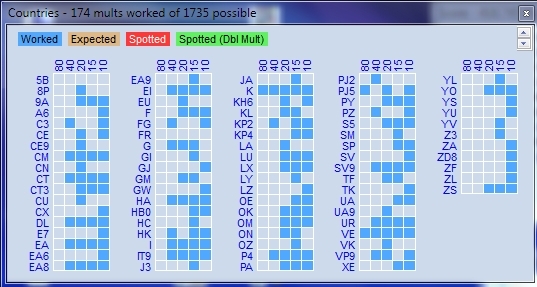 42 different DXCC entities were worked. Fun contest and I’m glad 10m opened up for a portion of it. Coming into the CQ WW RTTY contest, I knew I could only participate on Friday and Saturday as I was heading out of town on Sunday for a business trip. Fired the radio and N1MM+ up just before 8:00pm ET (0000z) and was ready to go. I started on 15m with the hex beam pointed to EU and the first station I hear and work is a JA station. I’m hearing west coast US stations too and work a few of them right at the start. Moved to 20m for a bit and found stations to work but nothing exotic. 40m had some good activity with NA stations and western EU stations coming in strong. After just 66 Qs logged, I called it a night. It was a very long week at work and I wanted to just lie down and fall asleep. Saturday morning I started on 20m and moved to 15m which was very active. 9am ET I took a quick check on 10m and could work some EU stations. 10m is such a great band and when it’s open during a contest it makes the event even better. I’m not going to say every time, but most stations would get my call the first time I sent it and our exchange would be as clear as a text message – no noise, no repeats, just a perfect exchange. I needed to run some errands in preparation for being away for a week but with 10m open I had a hard time stepping away. Saturday afternoon I was able to get back on and spend a good part of the remainder of the day on the air. 10m was open and active all afternoon and I spent most of my time there, dropping down to 15m for a spin up and down the band for any new stations I hadn’t yet worked. I’d flip back to 10m, work any new stations, and then switched to 20m to work up and down the band there. Late Saturday afternoon with antenna pointing west I looked on 10m and quickly got KH7. After scanning the band I heard a ZL3 and after a couple calls got them in the log. On 20m I worked VK3 with the hex beam pointing east. He was very strong and got my call and report on the first try. I didn’t switch to 40m until 9:30pm (0130z) and like the night before, EU signals were coming in strong. For the first time in the contest I went to 80m and worked NA stations in the US, Canada and Caribbean. Not a lot of points but most were multipliers which pumps up the overall score. At the end of the night before shutting down I took a quick look on 20m and came across KC4AAA in Antarctica. He had a good pile going so I’d give it a couple calls and then try and work another station elsewhere on the band before trying again. I was going to head to bed but spent 10 more minutes before I snuck my call in and he came back to me and I got Antarctica in the log for my 30th zone. I ended the night with 465 Qs and figured that might be all I worked in the contest since I had to travel the next day. Sunday morning I got things ready for my trip and helped clean things up around the house. I was ready to head to the airport with 90 mins to spare so I fired things up and spent 90 mins Sunday morning on 10m having a blast. I even got a ZD8 (Ascension Island) station in the log. I was able to add another 48 Qs into the log for a total of 513. Antarctica was worked but is out of the picture. Some interesting stats… Worked 379 unique stations but just one station (NR5M) on just all 5 bands. If I was able to work on Sunday maybe that could have been more stations. I did work 8 stations on 4 bands including SV9CVY, Michael on Crete. Michael was very strong on all 4 bands.